One of the things that draws people into watching the immensely popular Game Of Thrones TV show is the realness in every aspect of the show, primarily when it comes to bloodshed. And there’s a lot (and we do mean a lot) of bloodshed. Among all of the timely, untimely, just, unjust, and all other deaths on the show based on George R.R. Martin’s famed ongoing book series, there are 15 of them that stand out as the most gruesome and bloodthirsty. This scene may not have been as bloody as the rest of them, especially since we didn’t actually see blood bursting out of what’s left of Ned’s neck, however it was still a pretty horrid ordeal for the viewers. We are just not used to the idea of a main character (or one of them) getting killed, especially so early on in the show. Alas, that’s exactly what happened as Joffrey’s spoiled and twisted little ways played out. As the little brat watched the spectacle completely satisfied, the sharpened steel blade went through Ned’s neck like it was slicing some butter. 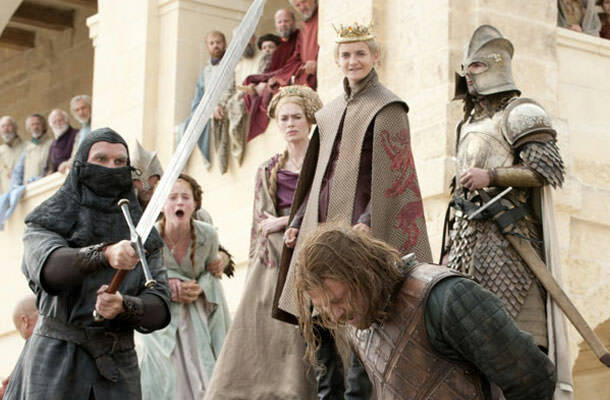 When will we ever forget the hair on Ned’s falling chopped head lightly swaying in the wind?